“It’s time to return to the original spirit and roots of Airbnb by restricting short-term rentals to a primary residence only,” according to Councilmember Barbara Bry as published in the San Diego Union Tribune Opinion Section on Sunday, July 8. Airbnb started out as a simple way to earn extra money by renting out your sofa or spare bedroom with the internet allowing you to find customers easily. It has evolved into a sophisticated multibillion-dollar industry in which investors are snapping up single-family homes and condominiums and turning them into mini-hotels. In addition, some apartment owners are turning units into short-term rentals. All of this means fewer homes are available for San Diegans at a time when we are facing a housing crisis. On July 16, the San Diego City Council will again address the issue of how to regulate this growing industry. It’s time to return to the original spirit and roots of Airbnb by restricting short-term rentals to a primary residence only. In December, the City Council spent hours listening to residents and debating short-term rentals. No proposal was able to garner five votes. If there’s a silver lining to that experience, it’s the fact that we now have the opportunity to learn from what other cities are doing around the state. Santa Monica’s home sharing ordinance was upheld by the courts when a U.S. district judge ruled in favor of the city and rejected the claims brought forth by Airbnb and HomeAway. Similarly, Pasadena passed an ordinance that allows a person to have one short-term rental unit which must be his or her primary residence for nine months out of the year. San Francisco also has the primary residence requirement and limits home rentals to 90 days a year. What do these cities have in common? Their city leaders understand that short-term vacation rentals deplete housing stock and turn neighborhood homes into permanent mini-hotels. On July 16, the San Diego City Council will hear testimony from the public about Mayor Kevin Faulconer’s short-term rental proposal. I support several aspects of the mayor’s plan — the three-night minimum stay in the Coastal Overlay Zone and the Downtown Community Plan, platform accountability which will require a hosting platform like Airbnb to provide the city with the records for each short-term rental transaction, and the focus on the enforcement component and a permitting process. Unfortunately, the mayor’s proposal does not include rules to limit short-term rentals to primary residences. His proposal allows for vacation rental hosts to rent out their entire primary residence for up to six months a year plus a second additional home with no limitations on the number of days annually. Under this scenario, an investor could purchase several rental properties and simply have the titles put in others’ names. Without the crucial primary residence piece, absentee investors will continue to commercialize single-family homes and turn them into mini-hotels in our residential neighborhoods. I remain committed to a short-term rental solution that puts San Diego residents first and protects our housing stock from investors. I continue to be supportive of unlimited home sharing in your own home and up to 90 days a year of a short-term whole-home rental of a primary residence. Under those guidelines, if you wanted to earn extra income by renting out your home during a vacation, Comic Con or other special event in San Diego, you could do so. As a high-tech entrepreneur, I embrace the sharing economy as an innovative and integral part of our overall economy. We can uphold the current zoning law, maintain the character of our neighborhoods, consistently collect Transient Occupancy Taxes from both home sharing and legal whole-house rentals, and preserve our precious housing stock for families who live and work here in San Diego. Our residents expect their elected officials to create policies that protect our sharing economy and residential zoning, while increasing our housing stock, not depleting it. Note: Barbara Bry represents District 1 on the San Diego City Council. 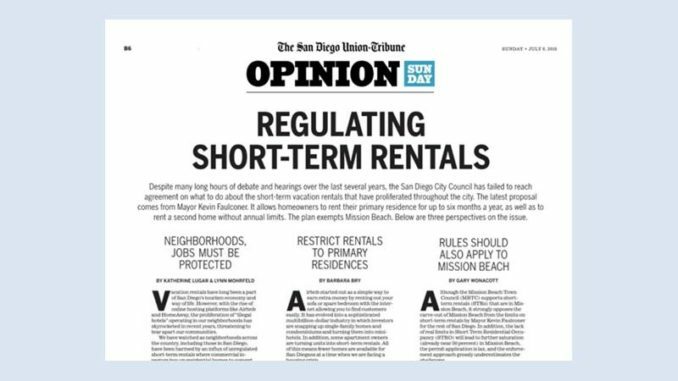 This Opinion was first published by the San Diego Union Tribune on Sunday, July 8, 2018, page B6, with two other perspectives on the Short-Term Rentals issue. Screen print from San Diego Union Tribune http://enewspaper.sandiegouniontribune.com/. Commentary posted at SD Union Trubune: http://www.sandiegouniontribune.com/opinion/commentary/sd-utbg-vacation-rentals-bry-sandiego-20180706-story.html. UCCA and the STVR working group are urging City Council to amend the Mayor’s proposal to allow only the primary owner, not outside investors, to rent out their homes to guests.